Skillet Pizza with Sweet Potatoes, Brussels Sprouts, and Ricotta is ready in a snap, made on your stovetop. When I’m hungry, it’s all I can do to sit patiently and wait for pizza to finish cooking, or wait as it’s being delivered to my door. That’s when this skillet pizza is what you need! I can grill all year long thanks to the weather where I live in Phoenix, and this recipe for Grilled Flatbreads with Red Spring Onions, Prosciutto & White Bean Sauce is a great way to make and enjoy pizza. But not everyone can hit the grill all year. So isn’t it great that you can enjoy a crispy pizza that is similar to grilled pizza – made on your stovetop – and made almost as quickly? I say, yes! This skillet pizza came together so easily (me jumping for joy, here). This recipe makes two small personal-sized pizzas. That’s great news if you like options, or if you have a few people in the house that can’t agree on toppings. The toppings are definitely seasonal, and the ricotta cheese is so creamy! How about a great skillet dessert? Would that make you jump for joy? A great one to make is Cherry-Almond Skillet Cobbler — so good (and so simple)! I have to admit that this Skillet Pizza with Sweet Potatoes, Brussels Sprouts, and Ricotta was completely convenient for me, as all the ingredients were prepackaged, and picked up at a recent visit to Trader Joe’s. If you have some time, you can use whole sweet potatoes — just use a vegetable peeler to create the thin ribbons, and just a knife or food processor to chop up the Brussels sprouts. The best part of my prepackaged goods for this pie? The pomegranate seeds! I’d much rather have someone else do the work when it comes to freeing these scarlet gems from their skin, but either way, I’d definitely use them. 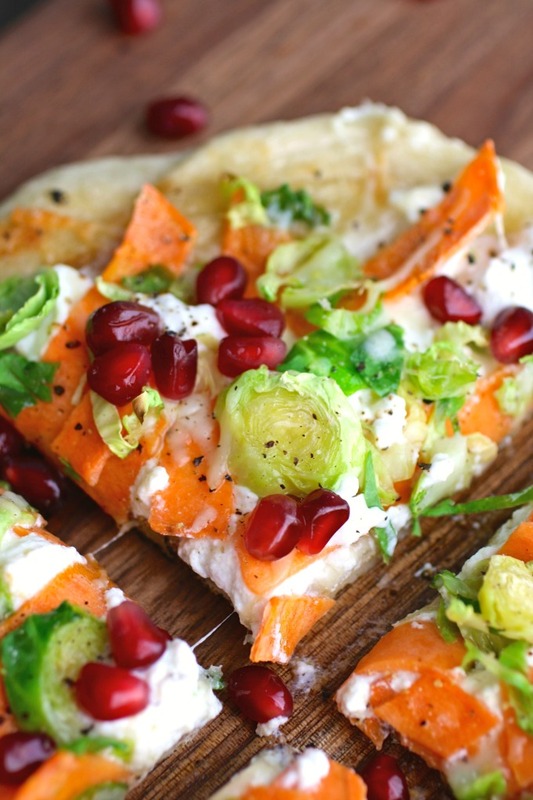 They add lovely color and tiny bursts of flavor for this seasonal pizza. 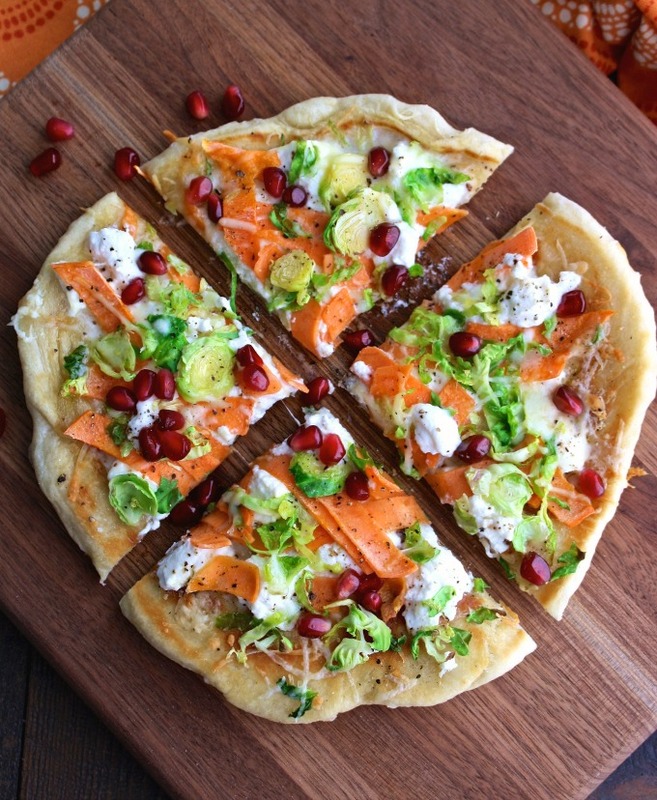 Try this Skillet Pizza with Sweet Potatoes, Brussels Sprouts, and Ricotta soon! You’ll love it! You'll love this seasonal pizza made right on your stovetop. It makes 2 personal-sized pizzas. Lightly flour a flat work surface. Divide the dough in half and one at a time, roll the dough out into a circle, just slightly smaller than the skillet. Add 1 tablespoon olive oil to a skillet over high heat. When hot, add the dough and cook for several minutes until the dough forms large bubbles, and the bottom is golden. Flip and reduce the heat to medium. Add the half the shredded Mozzarella to the dough, and dollop half the ricotta around the top. Add half the sweet potato ribbons and half the Brussels sprouts. Drizzle 1 tablespoon of the olive oil over the top, and season with salt and black pepper. Cover the skillet with a lid or aluminum foil. Cook for a few minutes, or until the vegetables have softened. Place the skillet (make sure it’s ovenproof), uncovered, under the broiler for just a few minutes until the edges of the dough are golden. You smarty pants! This looks like the best pizza ever and I love that it's in a skillet. Thanks, Ginny :) I hope you give it a try soon!! Oh goodness... I haven't had breakfast yet, but now I want your beautiful pizza! It looks phenomenal! I love the combination of flavors! Now this looks interesting. So many different combinations my mind is working. Thanks so much for your kind words, Kathy!! This is gorgeous! So colorful and healthy! I have never had anything like this! It looks amazing.. Pinned for later! Thanks, Lauren! Hope you try it soon and enjoy! This looks so fresh and enticing! I've never made pizza in the skillet before! Thanks, Amanda! I hope you try it -- it's sooo easy to make this way! Pizza does rule and this one is out of the park! I can't wait to give it a try! This looks delicious and super healthy! I love flatbread in all forms. Thanks, Katherine! This is a keeper! Oh, this looks and sounds perfect! I can't wait to try one of my own! Thanks, Leah! Hope you try it soon! A skillet pizza - what a great idea! I seriously have to try this! Love all the fall flavors too! Thanks, Taylor! It's soooo easy to make! LOVE the combo of flavors! I love your slogan -- I saw a shirt with something similar! 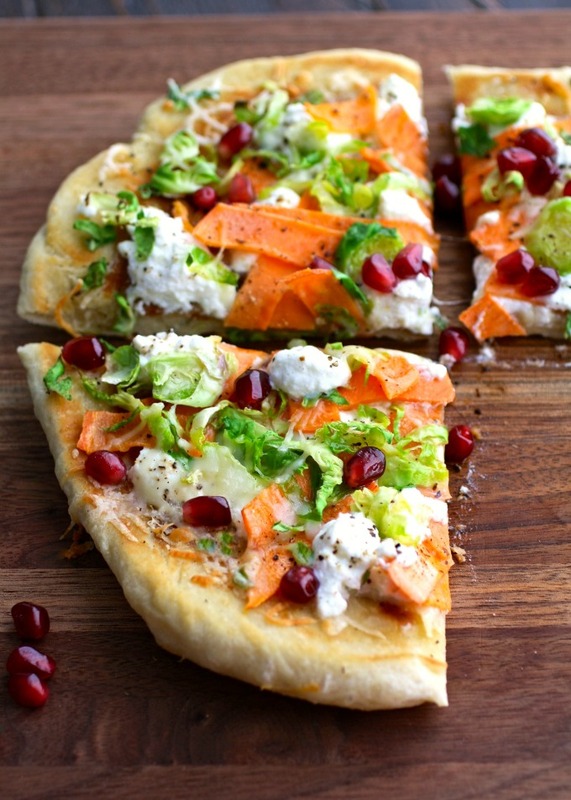 And I love the pizza, especially the pomegranate seeds! mmmm that is probably one of the best looking pizza ever! How pretty! This looks so good! I've never made a skillet pizza before but It's something I'd love to try! Hi Cara! It's soooo easy to make this way! Hope you try it and enjoy! Loving the toppings on this pizza! Can't wait to make it! Thanks so much, Anna! Hope you enjoy it! This skillet pizza looks wonderful! 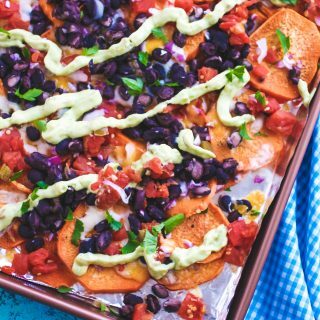 I love sweet potatoes on everything, so I know I would love this recipe! I can't wait to try it, thank you for sharing! Hi Ashleigh! I love sweet potatoes, too! This was really good and easy to make, too! Beautiful colors! What a unique and delicious looking recipe. Thanks for sharing. I love all the colors on this pizza. What a great flavor combo - trying this soon! This skillet pizza is perfect for our Sunday brunch! It looks delicious. I have never tried a skillet pizza. It sounds delicious! Those toppings are calling my name. I love sweet potatoes! This sounds delicious and healthy! Oh wow sounds great! Looks so tasty and flavorful, love the colors and combination too! Mmmmmmmhhhhhh this looks soooooo tasty. I would so love to try this this weekend. Thanks for the info, tips and steps! This looks SO GOOD! I love brussesl sprouts, but would have never thought to put them on pizza. Skillet meals are just the best! Love this pizza skillet. This flavor combo sounds incredible. Saving to make soon! This looks good! I want to start eating less meat but I feel it difficult to not eat ordinary pizza, but this looks good!